Angie Williams Cox, a figure of local controversy, could easily be the subject of a novel. This paper is not an effort to air the controversies surrounding Angie Cox; it is an attempt to relate her philanthropic works. Her gifts ranged from small amounts to friends and relatives to millions of dollars to an institution of learning. Angie Cox’s home town of Pardeeville benefited from her generosity in several instances. Her most outstanding and lasting contribution to the town was the Angie Williams Cox Library. Other local charitable works such as the American Williams Camp and her development of the Shore Acres Subdivision are less well known today. Outside of her native region, beneficiaries remember Angie Cox for her contributions to the rural schools of Kentucky and North Carolina and for her establishment of a School of Government at the Principia, a Christian Science educational institution in Illinois and Missouri. Merle Curti in his American Philanthropy Abroad states: “What Americans have done through nonofficial efforts to help people abroad has been closely related to what has been done at home for disadvantaged members of the population of the United States.” This author did not discover any indications that Angie Cox had interests in or gave to foreign nations, yet with a few changes in wording; Curti’s statement would describe her philanthropic works: What Angie Cox has done through private efforts to help people living in other states has been closely related to what she has done at home for disadvantaged citizens of Pardeeville and Wisconsin. Angie Cox considered persons with little schooling disadvantaged citizens. Her means of providing all with advancement opportunities was in giving them the Angie Williams Cox Library and filling it with educational material. Her “philanthropy abroad” consisted of providing similar services to persons living in areas outside of Wisconsin, particularly in North Carolina and Kentucky. 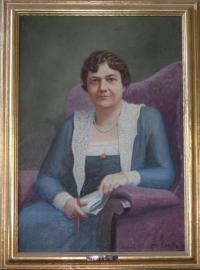 Mrs. Cox lived during a period of emerging American philanthropy. As an avid reader, she undoubtedly had occasion to study the philosophy of Andrew Carnegie and perhaps to have modeled her philosophy of giving after his. Carnegie believed the rich should give during their own lifetime for public purposes, but that this giving should be so constructed as to encourage self-help. By example, Angie Cox showed this to be her philosophy as well. Carnegie’s many gifts to libraries around the world might also have been a determining factor in Angie Cox’s building and supporting libraries. The parents of Angie Williams Cox were both born in the Town of Marcellon, Columbia County, Wisconsin. Her father, Robert Morris Williams (1850-1931), and mother, America Smith (1852-1939), were married October 27, 1868. They found it difficult to establish a permanent residence. During the first year of their marriage they lived on the farm of Robert M. Williams’ father, but in the fall of 1869 they moved to Pardeeville where the young husband tried his hand as a blacksmith. Thus started years of wandering throughout the United States and working at a wide variety of jobs. From 1869 to 1898 Robert Williams worked at ten different occupations in thirteen towns in Wisconsin, New York, Alabama, and points in between. Angie Williams (born January 1, 1870 – died February 18, 1955) was the oldest of six children. She was educated at various schools throughout the country as dictated by her parents’ frequent moves. At the completion of her public school career, her uncle, Asa Smith, financed her education at the State Normal College, Florence, Alabama. She graduated in 1891 and obtained a teaching position in the Ironwood, Michigan, city schools. She was a popular and well liked young woman who enjoyed visiting friends and relatives. It was on one such visit to her Aunt Belle Smith in Chicago that she first met her future husband. Amaariah George Cox (1849-1941) was born in a log house on the farm of his father in the town of Munda, Livingston County, New York. As a youngster, he prided himself on his mathematical ability and instructed fellow students in arithmetic. Upon graduating, he became for a short time a school teacher in rural schools in New York. From 1868 until the panic of 1873 he worked for a tug and wrecking business in Cleveland, Ohio. In 1874 he began working for the Rubber Paint Company for $1,000 annually, and within the year the company placed him in charge of the Chicago branch. Shortly thereafter he became the exclusive handler for Carter White Lead Company in Illinois, Indiana, Wisconsin, and Michigan. To increase business with less personal sales work, he conceived and sold the idea of putting paint departments in large department sores. On November 1, 1891, the Rubber Paint Company owners gave A. G. Cox the opportunity of buying the concern. Seven months later he had $50,000 for the first payment and purchased the firm which included as a subsidiary the Zeno Manufacturing Company. By 1894, Zeno produced chewing gum for various concerns of which the most important one was the William Wrigley Jr. Company. In 1895 A. G. Cox purchased a 1,500,000 acre chicle plantation form J. E. Plummer of British Honduras. This assured him of a constant and reasonably priced supply of an important ingredient of chewing gum. In 1911 the Zeno and Wrigley firms merged, and Wrigley began manufacturing its own gum. Amaariah Cox became vice president and treasurer of the Wrigley Company upon the merger. Amaariah Cox and Angie Williams were wed September 30, 1896, in Nashville, Tennessee. This was the second marriage for A.G. Cox. He had two children, Olive and Blanche, by his first marriage. His union with Angie produced no offspring. Amaariah Cox left an estate of some $4,000,000 upon his death in 1941. Federal and state taxes took about half of this, and Angie Williams Cox received one-third of the remainder. This bequest enabled her to carry forward and expand her philanthropic work. The move to establish public libraries during the first fifty years of Wisconsin statehood was a slow process. Of the approximately 30 public libraries in the State in 1896, private benefactors established, in while or part, 11. Donors gave land, buildings, books, and endowments for continuing support. The period 1896-1922 was an era of accelerated growth in the establishment of public libraries in Wisconsin. By 1904 there were 126 free libraries in Wisconsin, 55 of which were housed in their own buildings. In 1922 there were 211 libraries and 290 by 1939. In the 43 years after 1896, Andrew Carnegie gave funds toward 63 public library buildings in Wisconsin. "Oh, but there ought to be books!" exclaimed the young girl, Angie Williams, on one of her many visits to friends and relations on farms in this section. Angie made this remark after she found only current copies of a local newspaper to read. Her interest in books was already evident in childhood. She would collect anything readable and pass it on to others so they too would be enlightened. At the time of one of her parents' many moves, she boxed her own books and sent them to an uncle in Dakota instructing him that when he had finished reading them she would advise him where to send them. After years of giving her books to friends and relatives, Angie Williams Cox in 1910 decided in a conversation with the editor of the Pardeeville-Wyocena Times, Harry P. Thompson, that these books might just as well be preserved for many people to read and suggested that the Times Office provide a shelf for these books. Thompson agreed, set up the shelf, and acted as unofficial librarian. In reality no librarian existed, for interested citizens borrowed and returned books on a self-service and honor system. This shelf of twenty volumes housed in a drab, dark basement was the initial step in an evolution resulting in the imposing three-story structure of today. The editorial also related that she would give $500 toward the support of such a library for the first year. As a result of this editorial the Civic Club, a local organization, and two members of the Village Board met with a representative of the state library department who outlined plans consistent with local library needs. These plans included a yearly budget of $900. The Civic Club adopted the proposal without a dissenting vote and began consideration of several sites for the library. Because of this aroused interest in improving facilities, early in December, 1924, Angie Cox met with the Civic Club, Village Board, and interested citizens. At this meeting she decided to purchase the Langdon Building on Main Street and convert it into a suitable library building. Civically oriented citizens formed a Library Board and authored by-laws approved by Mrs. Cox as sponsor of the library. The Angie Williams Cox Library was opened March 9, 1925. Members of the library board signed the Articles of Organization on October 24, 1925; and the State of Wisconsin granted the library its corporation rights on November 5, 1925. The library had a very successful first year. Books in inventory increased by 2.5 percent, residents borrowed thousands of volumes, and the Village Board donated $250 to the library. Angie Cox spent over $1,800 for books, taxes, insurance, librarian schooling, and other improvements during the premiere year of the institution's existence. In an attempt to increase interest in the library and to add another source of local financial support, Angie Cox founded the "Antique Shoppe and Woman's Exchange." She furnished the capital for this enterprise, purchasing antiques and small gifts to be sold by the shop. Profits went to the library. The women of the village and area brought old furniture, needlework, preserves, pickles, jellies, and other small items to be sold. The library received a small commission on these sales, the rest going to the women. This enterprise existed from July, 1925, to September, 1926, bringing in $300 for the library. This endeavor ended because the library was growing and needed all the room the building offered. This growth continued, and in 1930 Angie Cox funded a sixteen by twenty-six foot extension. The library had earned the right to exist. Book circulation had reached 17,420 in 1930, about three times the 1925 figure. The number of patrons increased steadily; the village board increased its support. The Library Board in 1934 estimated the value of the property exclusive of the building at $18,975. By this time, the library had also overcome a grave legal threat to its existence. During the fall of 1926 some citizens of Pardeeville contended that Article Seven of the library's Articles of Organization discriminated against Catholics. This article excluded Roman Catholics from being members, employees, or officers of the library board. The ensuing controversy was not along religious lines. The discoverers of the discrimination were the Rev. William Blake, pastor of the Presbyterian Church, and William Ruehl, a master Mason. Blake, Ruehl, and others contended that this discrimination made the library a private institution and the village eligible for a refund of the money it had given to support the library. The village actually was contributing money to the Library Board, but designating this as a contribution to a civic center. Some citizens of the Pardeeville branded this a ruse used to carry through an appropriation for support of the library. Twenty-nine citizens, seven of whom were Catholics, signed a petition demanding rescinding of the order and return of the money by the library. The Village Board refused to act on the petition, for it was awaiting an opinion from the attorney general. The petitioners did not wait, but filed their suit. "It is persecution, nothing less," said Rev. H. (Hugo) J. Koester, pastor of St. Mary's Catholic Church at Pardeeville. "It is such autocracy such as Russia never suffered during the reign of the czar. Not that the Catholics will suffer from the situation. It is the basic principle that galls." Father Koester opened his own library of several hundred volumes to those who did not care to patronize the Angie Williams Cox Library. The Library Board was of the opinion that as long as the library showed no discrimination in service, it should have public support. The Board might also have referred to the Carnegie section of 1901 as incorporated into state statutes regarding libraries. The Wisconsin Supreme Court in a 1916 case originating in La Crosse held in substance that any library which was open freely to all the people was a public library and eligible to public support under the law, whether or not the library had been established by action of the municipal legislative body. In testimony before Judge Nabor, Dodge County, Wisconsin, May, 1928, Koester admitted he had never been refused permission to use the library, but said he had never attempted to use it after he had discovered the provision excluding Catholics from serving on the Board of Directors. In cross-examination he admitted he had drawn a book from the library shortly after it had opened even though he had previously insisted that he had never known of a Catholic taking out a book. Bertha Spicer, the Librarian, and Angie Cox testified that books for the library had been selected by recommendations of the Wisconsin Reading Circle, the State Library Association, instructors in village schools, and civic clubs. Angie Cox further testified that she had provided all but about 200 of the books in the library and had attempted to provide no books which would create any sentiment in favor of any church or sect. Under cross-examination, she stated that the provision excluding Catholics from the Board had been placed there because she believed Protestants would administer it more according to her ideas, but denied that she objected to people selecting books simply because they had received instruction which differed from her training. Angie Cox had ordered a Ku Klux Klan placard out of the library because she would not have it on her property. Harry Thompson, a Board member, had ordered copies of The Menace, an anti-Catholic publication, removed. Bertha Spicer stated that about fifty Catholics were at this time drawing books from the library. Testimony of Angie Cox and J. W. Jamieson, President of the Village Board, also established that Angie Cox had threatened to remove the library to some place where it would be appreciated unless the village appropriated some money annually toward its support. About this time, May of 1928, the Library Board revised Article Seven of the Articles of Organization. The Board hoped this revision would clarify the intent and meaning of certain terms contained in Article Seven. The revised article deliberately stressed that members of the Roman Catholic Church had free access to the library and free use and benefit of its books, the same as other persons. The plaintiffs appealed the case to the Wisconsin Supreme Court. Justice Marvin B. Rosenberry of this court spoke for the majority when he issued this opinion in April, 1929. Shortly after this decision in favor of the defendants, the Village Board renewed its lease of the library property for $500 a year. During the years 1927 to 1931 the library received $6,954.35 from Angie and $2,200 from Amaariah. The third step in the evolution of the Angie Williams Cox Library began in May, 1934, with the purchase of the old Odd Fellows' Hall by Angie Cox. It was located across the street from the library and a few doors south. Leon E. Stanhope, an architect from Milwaukee and Chicago, supervised its remodeling into a civic center and library. A local contractor tore down the original front wall and extended the building twelve feet to the edge of the sidewalk. This was to become a three-story Georgian colonial style structure. By the time all work was completed, this building and its remodeling had cost Angie Cox between $33,000 and $36,000. Remarkably, this was a depression year when many people were without work, and the local bank had closed its doors. Dedication of the new library occurred on Sunday, August 26, 1934, with a large crowd in attendance. Library officials sealed the cornerstone of the library after placing within it a copper box containing the library's Articles of Incorporation and amendments to it. A history of the library, a short history of Pardeeville, a list of contributors to the bronze tablet, and copies of the Pardeeville-Wyocena Times containing details of the library. The official dedication program consisted of short addresses by various local officials, county and state officials, and the major address by Mrs. Cox. On October 1, 1934, library books and equipment were moved into the new Angie Williams Cox Library, and its doors were opened to the public shortly thereafter. Mrs. Cox conveyed the title to the library real estate to the Library Board in a series of equal gifts of one-third interest each on November 8, 1934, June 18, 1936, and August 10, 1937. In 1941 she began to endow the library with gifts of stock. Her first gift was 210 shares of Wrigley Stock which she valued at $17,430. She had given over $37,000 by May of 1950. In a letter written that month she said she had given $149,286 to date. When she died, the library received $25,000 from her estate. In 1985 the Angie Williams Cox Library joined the Columbia County Library Association and the South Central Library System. Because it became a Public rather than a Private library, the Village Board appointed five directors to oversee the day-to-day running of the facility. The Village leases the building from the Endowment Board and provides operating income in addition to the funds from the Endowment Board. Since then the Library has been run by two separate boards with two different tasks. The Public Board buys books and other materials, hires employees, and is involved in the day-to-day running of the library, while the Endowment Board maintains the building and grounds, pays the heat and insurance, plus provides extra needed items that will not fit into the budget. Examples are the recent purchases of a digital camera, a second phone for internet use, computers for public use, lap-top computer, color laser printer and replacement of the copy machine. They recently added air-conditioning, upgraded the heating, and installed automatic doors for the handicapped ramp for a total of $21,000. The Endowment Board, along with other contributors, built the elevator to provide access to the building, the handicapped ramp, and the platform the community band uses for summer concerts. Their greatest expense was the purchase of the old liquor store, which was razed and landscaped with a park, an extension of the library wall, and wrought iron fencing. Capital expenses for these improvements were over $74,000.